In two independent school studies conducted in Illinois, the composite scores of 170 high school juniors prove the effectiveness of Doorway to College Foundation's ZAPS® instruction. 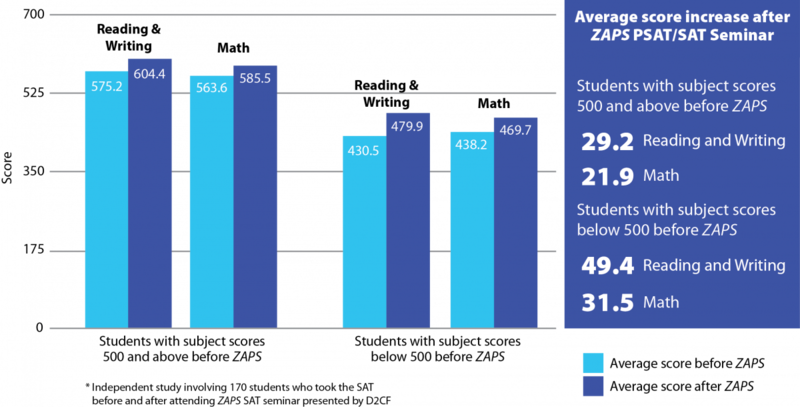 Students who take a ZAPS SAT strategy seminar or webinar typically raise their scores by an average of 26 points on the SAT Math section, and often higher (max score: 800). They also typically raise their Evidence-Based Reading and Writing (EBRW) score by an average of 39 points (max score: 800). If your school or district is interested in conducting a case study on ZAPS test prep for improving ACT or SAT scores, please contact the Doorway to College Foundation research department for assistance at research@doorwaytocollege.com.